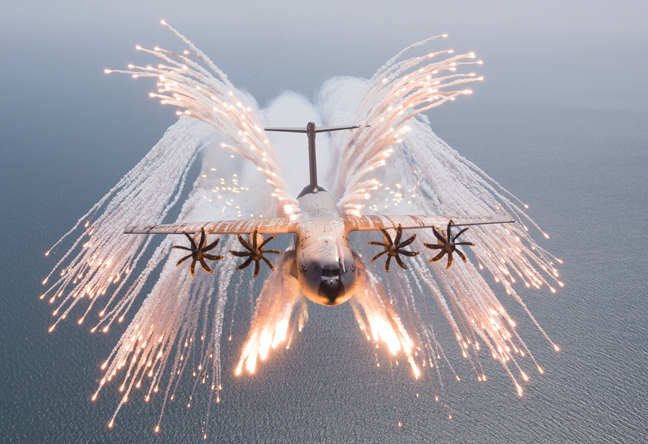 Flare dispenser trials culminated in this spectacular full flare jettison test of the Airbus A400M. Airbus Defence and Space Military Aircraft is scheduled to deliver the first of 22 A400M airlifters to the Royal Air Force in September. The delivery of aircraft MSN15 not only will mark the start of operations by a third country, but also represents the introduction of new capabilities as an important step along the type’s development roadmap. To get those capabilities into service has necessitated an intensive flight-trial campaign in the first part of this year. By mid-June Airbus had delivered two A400Ms to the French air force and one to Turkey. Another four French aircraft and one Turkish are in the process of delivery or the final stages of test and assembly. This first batch of aircraft is cleared for a basic logistic mission (initial operational clearance) that allows the aircraft to perform the strategic airlift mission. French aircraft have already been involved in the French intervention in Mali last December, and have transported helicopters to French Guiana in South America. With the first British aircraft, MSN15, comes an initial tactical operating capability (also known as SOC1), which allows paratroops to jump from either ramp or side doors, and permits the use of the RAS/Wedge aerial delivery system. The latter involves loads being delivered from a special frame that allows them to be carried on the rear loading-ramp and dropped through the upper door. With these clearances in place, the A400M can deliver both paratroops and support equipment in a single drop. Other elements of the initial tactical capability include combat vehicle offloading and an initial clearance for operations from unpaved runways. There are also some systems improvements, and the aircraft have a tactical communications management system. While the RAF is the first to get new-build aircraft in this configuration, the initial batch of French aircraft is also likely to be brought up to this standard at an early stage. In order to clear the aircraft for initial tactical capability the Airbus flight-test team has been extremely busy, particularly with air-drop tests. Paratroop test campaigns were conducted in January at Zaragoza, Spain, and in April at Fonsorbes, France, and later in Turkey. Further trials leading up to final qualification with a stick of 58 paratroops are due to be completed before the end of next month. RAS/Wedge tests were undertaken in February and March at Fonsorbes, clearing the A400M to deliver up to 4 metric tons from the rear ramp using this method. In May a series of air drops was conducted of up to 12 bundles delivered from the paratroop doors to extend the aircraft’s capabilities yet further. Other elements of the requirement were cleared last year, including operations from unpaved runways down to a rating of CBR11, performed at Ablitas in Spain, and combat vehicle offloading that was undertaken at Boscombe Down in the UK. The aircraft was also cleared for the use of night-vision goggles and the enhanced-vision system in both low-level and formation flight. RAF air and ground crew are already preparing for the arrival of the A400M, with pilots currently in training at the Sevilla-based international training center. In May the UK national training center at Brize Norton was officially opened, although the newly built building was available for use as of March. Designed, built and operated by a joint venture between Airbus and Thales, the UK NTC is scheduled to begin ab initio courses for aircrew from next April. Several elements are already in place and in use, including the computer-based training and CMOS (cockpit maintenance operating system) maintenance trainer. The loadmaster workstation trainer is undergoing final tests, and the first of two full-motion flight simulators has been installed and is awaiting acceptance. A second simulator is due to be installed in 2016, as well as a cargo-hold trainer. While the focus of this year’s trials was in clearing the initial tactical capability for the RAF, the test team is pursuing an intensive campaign to move the aircraft to what is termed the “2015 configuration” (SOC1.5), due to be introduced in the middle of next year with MSN32. Key elements of this standard include initial air-to-air refueling capability, air drop of loads from the rear ramp, combat offload of pallets and the implementation of the full defensive aids subsystem (DASS). Further capabilities to be added after SOC1.5 in 2016 to 2018 are mostly software-driven changes to the flight management system. In connection with DASS trials, the flare dispenser system was certified in March after a series of tests culminated in a full flare jettison trial. The radar-warning receiver is scheduled to be approved around the end of the year, for MSN21 or 22, and the missile warning system (MWS) thereafter. A series of background recording missions has been flown in conjunction with the MWS clearance campaign. For air-to-air refueling the A400M has begun wet contact trials with a Spanish Hornet receiver, Airbus having finalized the wing pod nacelle strake configuration in April. As a receiver, the A400M has undergone more than 60 contacts with a Transall C160 tanker, and has just embarked on a campaign receiving from an RAF A330 Voyager tanker. This fall the A400M will begin a series of air-drop trials with both gravity drops and parachute-extracted drops from the rear ramp, including extracted loads of up to 16 metric tons. Since the aircraft’s first flight on Dec. 11, 2009, the Airbus A400M fleet had racked up 6,343 hours in 2,278 flights by the end of May. MSN1 has been retired, and MSN3 is due to be grounded in October. Although no longer used for tests, it has been retained for a few months to assist with customer training. MSN4 is at the Sevilla-San Pablo site in Spain, while MSNs 2 and 6 are based at Toulouse, France. By mid-June Airbus DS had two aircraft in the delivery process (MSNs 10 and 11), with another 13 on the final assembly line at Sevilla-San Pablo. Among them are the first five for the UK (MSNs 15, 16, 17, 20 and 21), the first aircraft for Germany (MSN18), which is due for delivery in November, and the first for Malaysia (MSN22), which is due for January. Beyond those aircraft another 20 were in various stages of production or assembly, and long-lead items were in procurement for a further nine, taking the total to 52. Airbus plans to deliver 11 this year and 22 or 23 next year. Currently, 174 aircraft are under contract for the seven European launch nations, plus export customer Malaysia. Airbus is currently responding to eight or nine RFI/RFPs and has set itself a target of signing up at least one more export customer by the end of this year, with the ultimate aim of selling 300 to 400 over the next 30 years. Following a visit to the Middle East last year, during which vehicle loading was demonstrated in Saudi Arabia and the UAE, the A400M has recently been on a sales tour to Mexico. The aircraft also appeared at the KADEX show at Astana in Kazakhstan.